It was a Tuesday if I recall correctly when it all began. 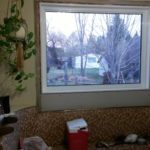 That may not be quite accurate since the conversation had been going on for a couple of months and had started to pick up steam recently, and preparational materials had been arriving in the house over the last few weeks. But that Tuesday when I arrived home from work I knew that the conversations were over. I found Honey up a ladder in the kitchen with a screwdriver in her hand. Cupboard doors were leaning against the wall. 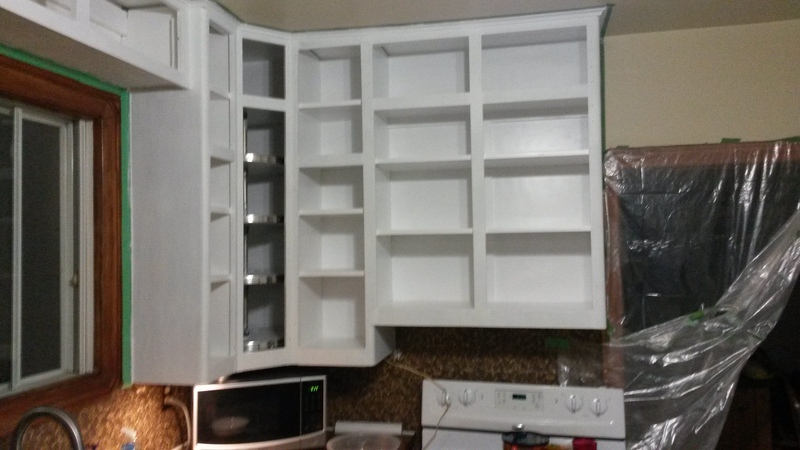 The cupboard contents had been removed and put in boxes. The boxes lay scattered in the dining room full of food, pots and cookware. She smiled down at me. “If you need a glass they’re under the butcher block.” I looked around the kitchen for the butcher block. It was nowhere to be seen. It’s a huge piece of furniture! These things don’t go invisible!! I looked up at her confused. “It’s in the dining room,” she said. Yes, I’m sure it was a Tuesday. 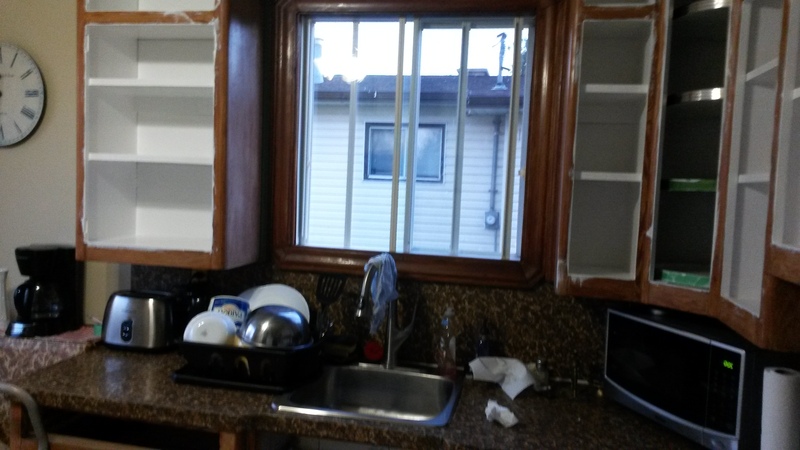 Home renovation is not my thing. I am incompetent when it comes to anything to do with tools. My solution to fixing anything is to pick up the phone and pay someone else. Honey is not that way. She grew up in a family where her father and grandfather owned tools and knew how to use them. I had an antique typewriter! Honey is also an avid fan of the Home and Garden programs and when it comes to home reno she knows her stuff. She is not afraid of DIY projects and getting her hands dirty, I’m afraid of losing one! So, in my family all DIY projects are initiated by Honey. 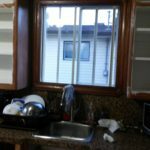 Most of the projects are cosmetic, paint, caulking and the likes. These are things I am strictly prohibited from doing. Anything that is visible to the eye is done by Honey. She is meticulous, I am impatient. Even when I use a paint brush I get it wrong. There is no way I can do a job well enough to please my wife’s eye, so I am not usually called upon to help with the project. 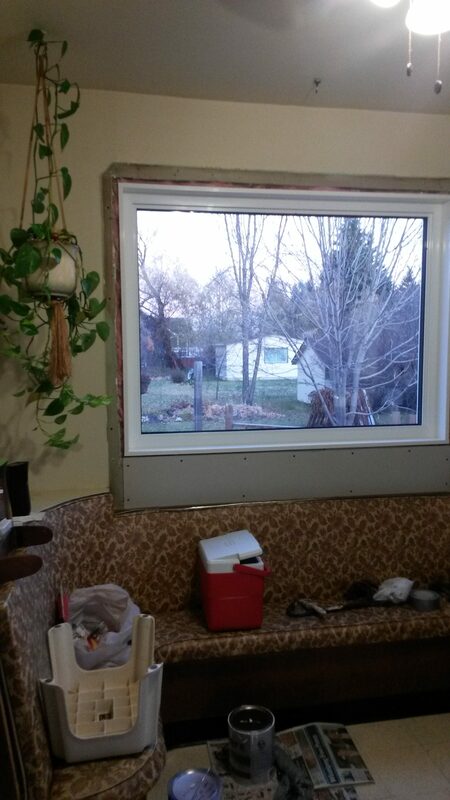 This year’s winter project is different, it is an entire reno of the kitchen and thus I will be called upon to assist. I do excel at demolition, if it can be broken, I can do it. 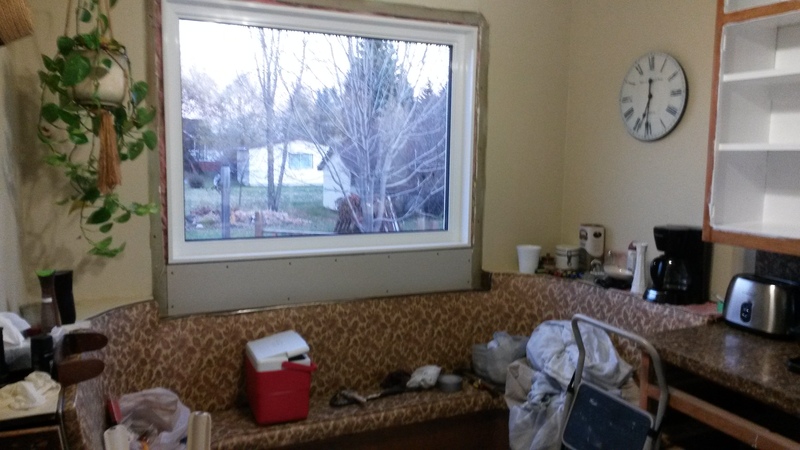 A banquette needs to be removed and replaced with a breakfast bar under a new window. 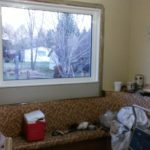 Replacing the picture window in the kitchen is far too big a job even for Honey, so it was dealt with by phone and wallet. 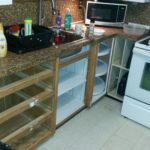 The old counter-top, floor and back splash must go and I am up to that task when the time comes. I’ve shined up my crowbar and oiled my chainsaw… I’ve got it covered! Once my demo work is complete there is construction to be done. This is a grey area for me. I am able to work badly with tools and am willing to try, but this should be avoided whenever possible. As is my way though, I have a guy for that. In fact, I have two guys that have all the skills and knowledge needed to assist in this endeavour and even better… they bring their own tools! And they’re the right ones!!! 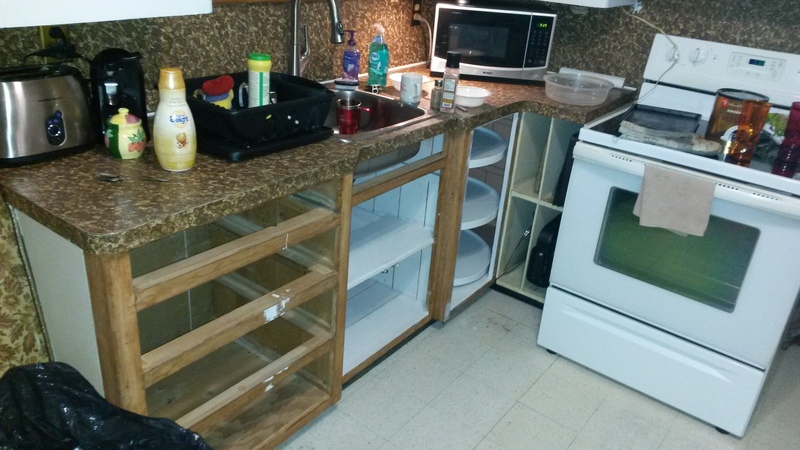 There are additional cupboards to be built to support a new counter-top and some minor electrical work to be done. All well within their capabilities, and they work for beer and pizza! This all began before our trip to see the grandchildren for Thanksgiving and will continue for months to come. Honey wants it all completed before Christmas but I am somewhat skeptical. It’s a big project and Honey has a full-time job! Her time is limited, just like my skills!! 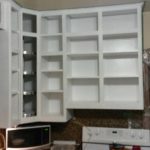 She’s been painting cupboards for a month!!! The house looks like we’re about to move and have a garage sale. Food is stored in the dining room and hallway; cooking utensils are on the dining table beside the cutlery and the oven mitts. Every day at feeding time the cat looks confused trying to figure out where her food is being served. I know there is a schedule, Honey always has a list, but I think Christmas is a stretch. Honey though, assures me she is on schedule. I feel guilty I am doing nothing to help expedite the job, but after almost 40 years together I have learned to just stay out of Honey’s way. She knows exactly what she wants and her “attention to detail”, aka OCD (her words, not mine), do not allow for my careless hands to be involved. My job is to give morale support and painkillers until told otherwise. I’m okay with that, since I would rather she was angry with herself over the final outcome, than with me. So, I keep my distance for now and touch nothing. Okay, I know that makes me a lazy coward but trust me when I tell you, that you never want to be on the receiving end of OCD anger fueled by Menopausal rage. There will be only one winner… and it won’t be me.